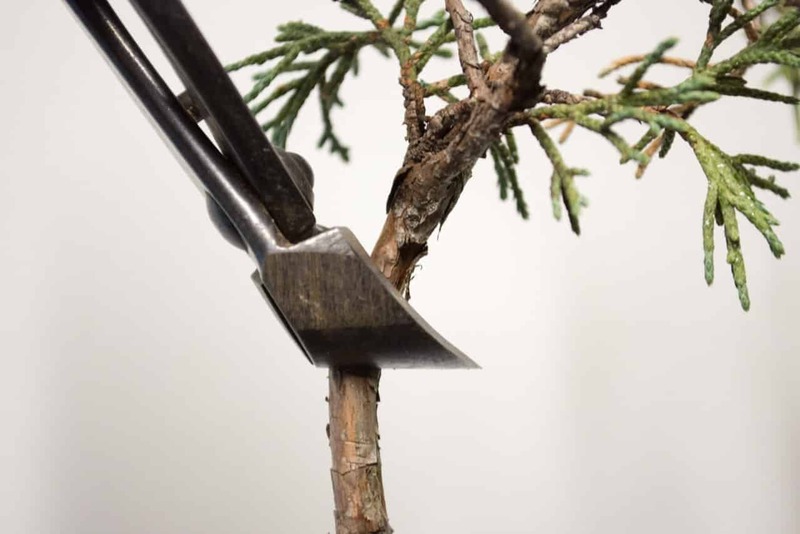 The most basic bonsai tools – scissors, concave cutters, tweezers, wire cutters and pliers – are pretty easy to use. Except for the concave cutter, all have non-bonsai counterparts with which we are familiar, and the concave cutter isn’t too tricky to figure out. Rather than discuss each in detail, I’ll offer a simple tip or two relating to their use or their care. Pliers are used for leverage when bending wired branches and for securing wires to each other. Bonsai pliers and non-bonsai pliers are equally suited to the task. The main difference between bonsai and non-bonsai pliers is the size of the head of the pliers. Bonsai pliers are often narrow which allows for use in smaller spaces. 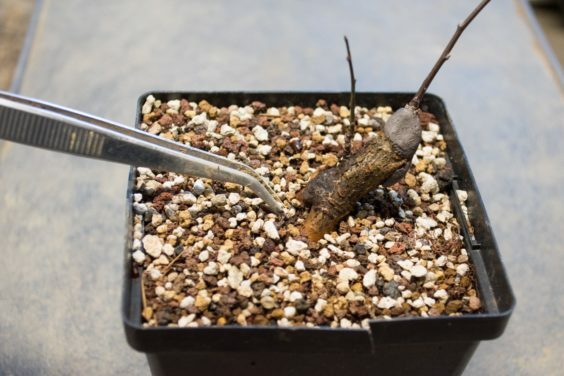 The most important thing to know about how to use pliers for bonsai is the rule known as, “pull, then twist.” When securing wires together, first pull the wires tight, then gently release the pressure as you twist. The maneuver requires some practice. Here I’ll thank Boon Manakitivipart for repeating the line, “Pull, then twist,” thousands of times over the years and drilling the advice into my head. If you wires look like any of the following, more practice may be in order. Wire cutters are straightforward tools. Some come with notches in the blades for cutting larger wires. If your wire cutters have such a notch, use it! Cutting wire near the tips is a sure way to break the tip of the wire cutter. The same goes for heavy-duty wire cutters. Do note, however, that some wire cutters have a flat surface below the cutting edge. For these wire cutters, make sure the wire is just above the flat spot when it’s time to cut. Aren’t heavy-duty wire cutters made for cutting wire that’s wrapped around branches? Yes, but cutting large gauge wires with the tips is a good way to damage wire cutters. Pulling the wire a short distance away from the branch before cutting can extend the life of the wire cutter. Like most bonsai tools, bonsai scissors come in a variety of shapes and sizes. When sharpening scissors, most of the sharpening is done to the outside surface of the blade. Sharpening the inside surface can create a gap between the blades that makes cutting difficult. After creating a good edge by working on the outside surface, gently smooth the inside surface to knock down steel that may have folded over while sharpening the other side. If scissors become loose, there may be a way to tighten them. 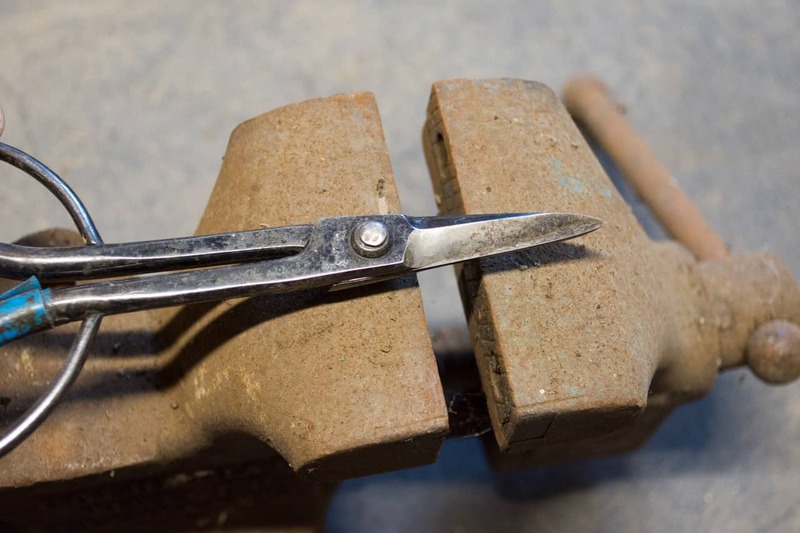 Higher quality scissors typically have a post connecting the two blades that can be tapped with a hammer to tighten the connection. First set the post on something hard like an anvil or vise. Then tap the post gently, at first, with a hammer, and increase the pressure of the blows until the connection tightens. Concave cutters are the traditional bonsai tool. They are also commonly used incorrectly. When removing large branches, use the blunt end rather than the pointy end. The pointy tips are properly used for removing smaller branches in hard to reach places. Bonsai tweezers can generally be grouped into two categories – bent nose and straight. Bent nose tweezers are used during repotting for cleaning out roots or removing surface soil. Straight tweezers are used for removing foliage. When plucking pine needles with tweezers, you may notice sap buildup makes plucking difficult. You can remove the sap with a wire brush. Some people use a lighter to loosen up the sap which wipes away easily when warm. Bent nose tweezers are handy for doing root work. Holding the tweezers close to parallel with the surface of the soil will let the angled tips glide over roots that may be crossing. Holding the tweezers at a steeper angle makes it easy to damage roots by snagging or tearing roots that grow perpendicular to the direction of the tweezers. I’ll end with a couple of questions I hear regularly. I’m new to bonsai, what tools should I buy? As few as you need. Sharp scissors or pruning shears make a good starting point for reducing foliage. When you start wiring, pliers and wire cutters will come in handy. What’s better, stainless steel or carbon steel tools? There’s a trade-off. Carbon steel tools are easy to sharpen but they rust if not properly cared for. Stainless steel tools fare much better when they get wet or are left outside, but they are much harder to sharpen when edges dull. Up next, post 7 of 10: how to secure bonsai in the pot. As a new but serious student, I’ve found this article to be very useful Jonas! Thanks for writing about something we all take for granted knowing but really may not. Thanks for the tips Jonas! I’ll have to forward this to my Mom with the Kaneshins scissors I just bought from you! Thanks again for this great blog! Hi Jonas, Good education on basic tool issues. What grit stones do you use for scissors, and assorted cutters? Do you use different stones for different tools? Are there other things you use other than grit stones? what’s the scoop on the back of the (bent nosed) tweezers for?! Good question Amin! I use the paddle at the end of bent nose tweezers for a variety of tasks ranging from picking loose bark on trident maples to scraping away old cut paste – it’s good for anything that comes to mind really. Hi Charlie – I’ll use a 700-800 grit stone for touch-up and a 200-400 grit stone for courser work when the blade is out of shape. I use the same sharpening stones for all of my tools, though sometimes I use stones with different shapes for tools that require them like concave cutters. I typically use water stones, though other stones work too.